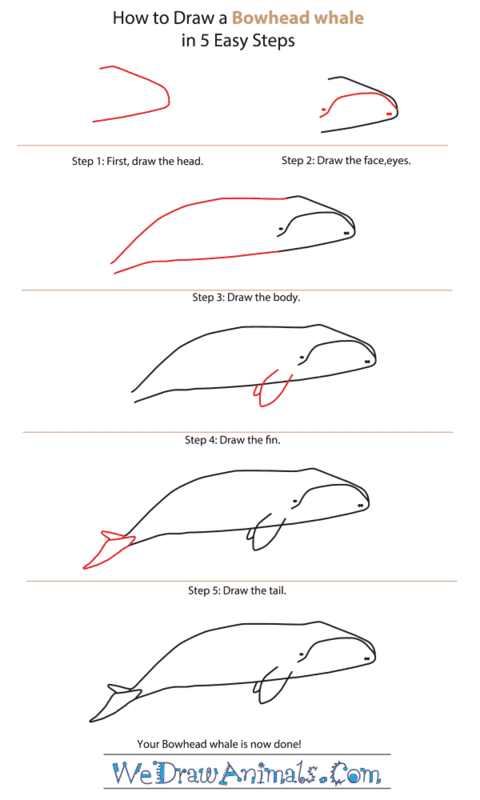 In this quick tutorial you'll learn how to draw a Bowhead Whale in 5 easy steps - great for kids and novice artists. At the bottom you can read some interesting facts about the Bowhead Whale. 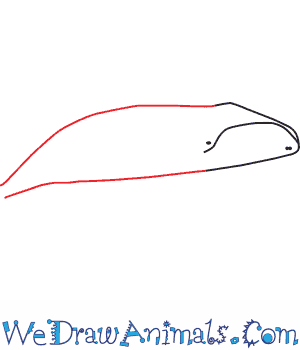 Step 1: The bowhead whale's head is shaped like the side of a stapler. 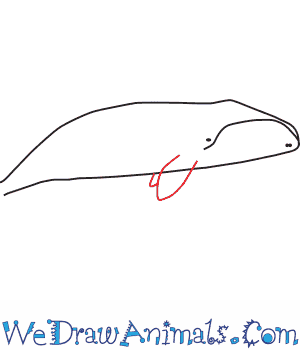 It is very hard so that the whale can use it to break ice when it needs to come up to breathe! Leave the end open for the body. 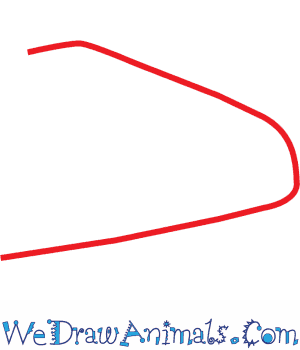 Step 2: Add a arched line in the middle, then an eye at one end. At the bottom of the other end, add a few dots. 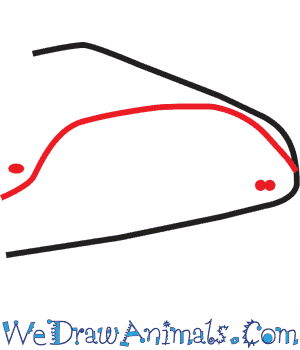 Step 3: Draw two lines that slowly come together at the bottom. Step 4: Next, add two leaf shapes for the fins. Step 5: Add two triangles, one small and one larger, for the tail, and then your bowhead whale is done! 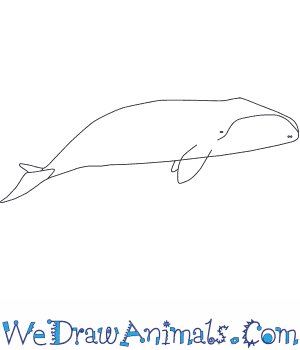 To color it, this whale is blue-black or black. The Bowhead Whale is a member of the mammal family and the scientific term for them is Balaena mysticetus. The proper name Bowhead comes from the bent shape of the whale’s face. The word Balaena refers to the baleen nature of the creature’s mouth, which traps plankton food when it swallows water and strains it back out. Other common names for this animal are the Greenland Right Whale, Arctic Whale, Polar Whale, Russian Whale, Russia, and Steeple-Top. This species has baleen strands that are almost 10 feet long. The crown of their head can break through ice that is 2 feet thick. The animal can live to be about 200 years old. The animal can weigh up to over 200,000 pounds. They commonly grow up to over 66 feet long. They weigh more than any other whale, except for the Blue Whale, but this animal has the largest mouth of any other animal in the world. Similarly, it has the longest baleen strands of any other animal. 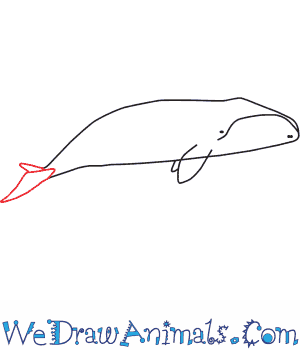 Also, no other whale lives exclusively in the Arctic waters, except for this species. They use their powerful head to break through the ice of cold water to breathe. No other animal has blubber under their skin as thick as theirs.